25 January, Three MK cadres, on their way to carry out a sabotage mission, take refuge in the Silverton branch of Volkskas Bank after realising they were being tailed by the police. They hold 25 civilians hostage and after a series of negotiations a police unit storms the back. All three cadres are killed including two civilians. This incident becomes known as the Silverton Siege. June, The African National Congress (ANC) publicly broke ties with Zulu Chief and Inkatha Freedom Party (IFP) leader, Mangosuthu Buthelezi. Countrywide protests erupted over wages, rent, bus fares and education. Zimbabwe became independent. The South African Congress of Trade Unions (SACTU) declared 1980 as the year of the worker. February, Thousands of high school and university students went on a prolonged boycott of schools, beginning at Hanover Park. 10 March, At the Black Sash congress at the SA Institute of Race Relations, Bishop Desmond Tutu lent his support to the Release Mandela campaign. 13 March, The South African Council of Churches (SACC) comes out in support of the Release Mandela Campaign. Sam Buti, President of the SACC said, "We recognise the unique leadership role still accorded to Nelson Mandela by very many South Africans ... We believe that the church in its role as peacemaker must help the people of South Africa to avoid needless suffering and bloodshed ..." and he urged "...local churches to promote the signing of a petition for the release of Nelson Mandela." 13 March, Lilian Ngoyi, 1956 Treason Trialist and president of the ANC Women’s League dies. 4 April, ANC insurgents launch a rifle, rocket and grenade attack on Booysens Police Station, Johannesburg. Pamphlets are scattered demanding the release of Walter Sisulu from Robben Island. 18 April, Zimbabwe gains its independence. 2 August, Petitions calling for the release of Nelson Mandela and convicted liberation soldier, James Mange, were circulated at a UN Women's Conference in Copenhagen. 500 signatures were obtained to pressure for the release of the two freedom fighters from Robben Island. 6 August, Dalindyebo Sabata, paramount chief of the Transkei, was deposed. 11 August, Chief Dalindyebo flees to Swaziland, Tembu chiefs visit Nelson Mandela to discuss the issue. 14 November, India honoured Nelson Mandela with its highest international civilian award, the Jawaharlal Nehru Award for International Understanding. Both Mr and Mrs Mandela were invited to the ceremony, but he was still imprisoned on Robben Island and Winnie Mandela was refused a passport by the South African government. Oliver Tambo, President of the African National Congress (ANC), accepted the award on his behalf. 16 December, Nelson Mandela had a life membership to the University of London Union conferred on him for "...the historic role he has played in the worldwide fight against racism." 22 December, Nelson Mandela was nominated for the Chancellorship of London University. 30 January, The South African Army raids Matola in Maputo, Mozambique and assassinates 12 ANC members. This is confirmed by General Constand Viljoen, Chief of the South African Defence Force (SADF), who announces that a South African commando attacked and destroyed the planning and control headquarters of the ANC at Matola in Maputo, Mozambique. The SADF exaggerates the figure and claims that 30 ANC activists were killed; and two SADF recruits were also killed. 8 February, Mozambique stresses its continued support for the ANC in a statement made at the funeral of 12 ANC members killed in the South African raid on Matola, Maputo, on 30 January 1981. 22 February, The Soviet Union supports Mozambique after the South African raid on Matola by sending two warships to Maputo. More are expected soon. 20-27 May, The International Conference on Sanctions against South Africa, organized by the United Nations (UN) in cooperation with the Organisation of African Union (OAU), is held at UNESCO House in Paris. Oliver Tambo addresses the conference on 21 May. 25-27 May, There are several sabotage attacks - in Soweto, on the Natal coast, East London and in Durban - for which the ANC claims responsibility. 29 December, Winnie Madikizela-Mandela is banned for a further five years and continues to be restricted to the small town of Brandfort. 20 March, A powerful bomb blast destroys the cells behind the Langa Commissioner's Court in Cape Town where thousands of pass law offenders have been sentenced. The blast causes widespread damage to the office which houses personal files on Africans in the Western Cape. The blast was part of ANC campaign aimed at creating confusion in the apartheid administration by destroying records of blacks, and took place on the eve of the anniversary of the Sharpeville massacre. No one was injured. In April, together with Walter Sisulu, Raymond Mhlaba and Andrew Mlangeni, Mandela were moved to Pollsmoor Prison. A few months later they were joined by Ahmed Kathrada. 14 June, Albertina Sisulu is placed under a banning order for the fifth time since 1963. 17 August, Ruth First is killed by a parcel bomb, sent to her by the South African security police, at the University of Maputo, Mozambique. 21 October, Barbara Hogan is sentenced to ten years in prison for High Treason in the Rand Supreme Court for membership and furthering the aims of banned ANC. 2 December, Afrikaans poet, Breyten Breytenbach, is released from prison after serving seven of the nine years to which he was sentenced in 1975. President Kenneth Kaunda of Zambia urged P W Botha to release Mandela. 9 December, South African forces raid houses in Maseru, killing thirty members of the ANC including seven women and children. General Constand Viljoen describes it as a pre-emptive raid to prevent attacks during the festive season. The government blamed a chain of sabotage incidents within South Africa on the ANC command structure in Lesotho. The incursion is widely condemned. 18 - 19 December, The African National Congress (ANC) claimed responsibility for the explosion at the Koeberg Nuclear Power station, which it claimed was in retaliation for its members being killed by South African commandos in Lesotho. 18 February, A bomb explosion in an administrative building in the Batho township of Bloemfontein injures 79 Black people who were seeking registration for employment. The ANC denies responsibility. May, The National Party (NP), through President P.W Botha, introduces a constitutional amendment which creadted its Tricameral Parliament, which included separate chambers for Whites, Coloureds and Indians, but excludes Africans. Rightwing 'verkramptes' break away from the National Party (NP) as a result of the proposed constitutional changes, to form the Conservative Party (CP). 20 May, An African National Congress (ANC) car bomb explodes outside the military headquarters in Pretoria, killing 19 and injuring more than 200. The government responds by attacking ANC houses in Mozambique and killing ANC members. Local authorities in Britain name streets and parks after Mandela. The British Engineering Union named an executive committee room after him. The City College of New York conferred honorary citizenship on Mandela and Glasgow awarded Mandela Freedom of the City. The University of London made Mandela a life Member. The British Labour Party invited Mandela to its party conference. The Bruno Kreisky Foundation awarded Nelson Mandela the Australian Human Rights Award. 3 June, The Johannesburg Star newspaper reported a student campaign at the University of the Witwatersrand to have Nelson Mandela be appointed Chancellor. 9 June, Three ANC members, Simon Mogoerane, Jerry Mosololi and Thabo Motaung convicted of attacking police stations, are hanged. 26 June, A sculpture in a city park by Elisabeth Frink dedicated to Mandela was unveiled in Dublin, Ireland. A second sculpture was unveiled in Dublin a year later. July, Many more British local authorities renamed streets and facilities after Nelson Mandela, and 16 adopted an anti-apartheid declaration. While it is generally contrary to UK practice to name streets after foreign or even British heroic figures, Camden, home of the Anti Apartheid Movement, renamed Selous Street after Mandela. Selous was a 19th century colonial explorer and hunter in southern Zimbabwe. 19 July, The Star newspaper in Johannesburg reported that the British Labour Party had invited the imprisoned Nelson Mandela to their annual party conference in Brighton. 24 July, Nelson Mandela was the recipient, in absentia, of the prestigious Simon Bolivar Award for "...his outstanding contribution to freedom and democracy". He was jointly awarded the with King Juan Carlos of Spain. 20 -21 August, The United Democratic Front (UDF) was launched in Mitchell's Plein, a coloured township, near Cape Town to fight the introduction of the Tricameral Parliament. The UDF was a coalition of anti-apartheid organisations sympathetic to the Freedom Charter.The launch is attended by delegates of 565 organisations. The launch is followed by a public rally of approximately 10 000 people. 19 September, Dr. Yusuf Dadoo dies in England after a long battle with cancer. He is buried at Highgate Cemetery, a few meters away from Karl Marx’s grave. 17 October, South African forces raid ANC offices of the ANC in Maputo. The raid is condemned internationally. 2 November, The constitutional referendum shows that the majority of Whites are in favour of P.W Botha's ideas for constitutional reform including the Tricameral Parliament. 24 November, Carl Niehaus is sentenced to 15 years in prison and his fiancée, Johanna Lourens, to four years for high treason at the Rand Supreme Court. 5 December, A bomb explodes at the Johannesburg office of the Department of Foreign Affairs becoming the 42nd attack by ANC saboteurs in 1983. 8 January, Oliver Tambo called on South Africans to '"Render South Africa Ungovernable". He also unveiled a larger-than-life bust of Mandela at the Royal Festival Hall in London. 31 January, President P W Botha announced in parliament that he had offered Mandela his freedom provided he unconditionally rejected violence as a political instrument. 10 February, Zindziwe Mandela read out her father's reply to P W Botha's offer of freedom at the Jabulani Stadium in Soweto in which Mandela rejected Botha's offer and called on him to dismantle apartheid and unban the African National Congress (ANC). This was the first time in two decades that the public heard Mandela's own words. Protest action spread throughout the country. 23 March, Dorothy Nyembe is released from jail and becomes an active member of the Natal Organisation of Women (NOW). July, A State of Emergency is declared over many parts of the country. It lasts for six months. August 1984, Elections to the Coloured and Asian legislative bodies were held for the Tricameral Parliament. 77 percent of the eligible Coloured voters and 80 percent of the Asian voters boycotted the elections because the new plan continued to exclude blacks. 11 September, Following unrest and rioting in the townships, the Minister of Law and Order prohibits all meetings of more than two persons, discussing politics or protests against or in support or in memoriam of anything, until 30 September 1984. The ban extends to certain areas in all four provinces, but is most comprehensive in the Transvaal. 12 September, On the anniversary of the death of Steve Biko, unrest breaks out in Soweto. When police open fire on protestors, COSAS activist Bongani Khumalo is killed. The Release Mandela Committee calls for a stayaway on 17th September, and up to 65% of residents heed the call. 26 November, Cyril Ramaphosa, a lawyer and General Secretary of National Union of Mineworkers, is arrested in Lebowa, on a charge of organising or planning to take part in a meeting in Namakgale. The local magistrate had banned meetings in the town. Release Mandela Committees are established and the world joins in, appealing for his release. 31 January, President P.W. Botha offers a proposal to release Nelson Mandela on condition that ‘he unconditionally rejected violence as a political weapon’. 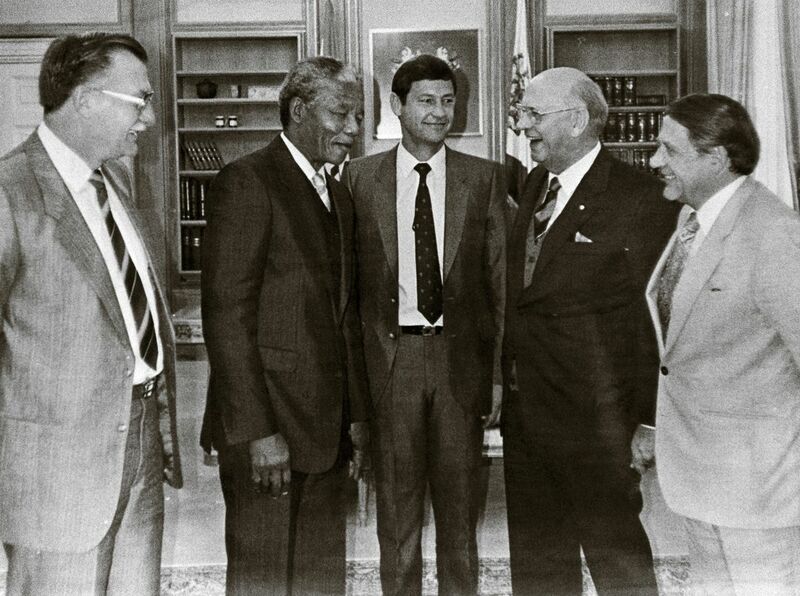 10 February, Nelson Mandela turns down the release proposal offered by President Botha. 15 February, President P.W. Botha announces that his offer of release to Nelson Mandela still stands and that government is prepared to talk to the ANC if it renounces violence. Four PAC security prisoners take up an offer of release and three other ANC prisoners reject this offer in a six-page memorandum submitted to the president. 13 April, Winnie Madikizela-Mandela made her infamous "...with our boxes of matches and our necklaces we shall liberate this country" speech at Munsieville near Johannesburg. Her statement came at the height of ungovernability in South Africa and the year was marked by mass stayaways, strikes and police brutality. 21 July, Many townships throughout the country had become ungovernable and began to attract international attention. The government declared a State of Emergency. 27 June, Four Eastern Cape UDF activists, on their way from Port Elizabeth to Cradock, are abducted and assassinated by the security police. The four, known as the Cradock Four, were Matthew Goniwe, Sparrow Mkhonto, Fort Calata and Sicelo Mhlauli. 1 August, Victoria Mxenge, a Durban attorney and the wife of slain attorney, Griffiths Mxenge, is assassinated in her home in Umlazi, Durban. 8 August, At a memorial service for Victoria Mxenge, members of the amaButho, an Inkatha Freedom Party (IFP) ‘community based guard force’ launches an attack on the mourners. 15 August, At the National Party (NP) Congress in Durban, P W Botha failed to make any announcements that were promised by Foreign Affairs Minister Pik Botha, that would reassure foreign investors. A small group of business leaders, led by Gavin Relly then chairman of Anglo-American, flew to Zambia to meet Oliver Tambo in the wake of the financial crisis. Minister of Justice, Kobie Coetsee, paid an unannounced visit to Mandela in hospital where he underwent an operation for an enlarged prostate gland. After his operation Mandela did not return to join his colleagues in Pollsmoor Prison, but was instead taken to a separate section with three big cells. For the first time in 24 years in jail Mandela is alone. 2 December, The Congress of South African Trade Unions (COSATU) is formed with a membership of 500,000 and 33 affiliates. This organisation is politically aligned with the banned ANC. Elijah Barayi is elected president, Chris Dlamini vice president, Jay Naidoo general secretary, and Sydney Mufamadi assistant general secretary. 30 December, Winnie Madikizela-Mandela is arrested for contravening a banning order prohibiting her from being in the magisterial district of Johannesburg and Roodepoort. 8 January, the ANC declares in a statement that 1986 will be the ‘The Year of Umkhonto we Sizwe, the People’s Army’. It extols the destruction of local councils, and looks forward to ‘the gathering collapse of the apartheid economy’. The government, it said, had lost the strategic initiative and its attempts at reform were collapsing. The slogan for the year, coined by Thabo Mbeki, is ‘Every patriot a combatant, every combatant a patriot’. The ANC launches Operation Vula an underground operation aimed at facilitating the infiltration of MK guerrillas into South Africa and maintaining open communication links between the ANC Leaders in exile, at home and in prison. Amongst some of its operatives are Sathyandranath 'Mac' Maharaj, Ronnie Kasrils, Pravin Gordhan, Siphiwe Nyanda and Billy Nair. February, The Commonwealth Eminent Persons Group visited South Africa to find ways to begin a political dialogue. 8 March, Moses Mabhida, MK commander and secretary-general of the South African Communist Party (SACP), dies of a heart attack in Maputo, Mozambique. He is succeeded by Joe Slovo who takes up the position in 1987. 16 March, All seven Commonwealth Eminent Persons Group members were accompanied by Minister Coetsee to visit Mandela at Pollsmoor prison. 16 May, Another visit was made by the Commonwealth Eminent Persons Group, including Australian Prime Minister, Malcolm Fraser and leader of Nigeria, Olusegun Obsanjo, to the guest house at Pollsmoor Prison, where Mandela assured them that he could control the violence in the townships provided that the government withdrew their troops and allowed him to travel unhindered. During their visit, the South African Defence Force attacks the neighbouring states of Zambia, Zimbabwe and Botswana. The Group leave the country immediately and recommend that economic sanctions against South Africa be increased and maintained. 19 May, The Commonwealth Eminent Persons Group took a proposal discussed with Mandela on May 16 and presented it to the Cabinet in Cape Town. The ministerial "hawks" however insisted that Mandela should first renounce violence. 12 June, A nationwide state of emergency was declared, giving the police more drastic powers. 4 000 people were arrested and detained in 3 weeks. Mandela requested a meeting with President P W Botha. Kobie Coetsee agreed to see him and Mandela was driven to "Savernake", the Minister's official residence in Cape Town. 25 July, The Johannesburg Rand Daily Mail reported that a 13 person United States congressional delegation had been refused permission to meet with jailed Nelson Mandela. Justice Minister Kobie Coetsee refused the delegation, headed by Chair of the House of Representatives Africa sub-committee, Harold Wolpe, without the providing of reasons. August, The United States Senate voted 84 to 14 for a comprehensive sanctions bill against South Africa imposing bans on new investment, loans, airport landing rights and exports of oil. Deputy Commander of Pollsmoor Prison, Lieutenant-Colonel Gawie Marx took Mandela on his first car outing in 24 years. Later, his warder James Gregory, took him on several excursions in and around Cape Town. He is allowed more visits as well as contact visits and was able to kiss Winnie Madikizela-Mandela and hug his children. 19 October,Samora Machel, President of Mozambique, dies after the plane he was travelling in crashed in the Lembombo Mountains, near Mbuzini, South Africa. Mandela sends his condolences from Pollsmoor Prison. He would later marry Machel’s widow, Graca Machel. 4 November, Oliver Tambo, accompanied by Thabo Mbeki, meets Mikhail Gorbachev at the Kremlin. At a press conference afterwards, Tambo announces that “...the Soviet Union stands firmly with us in the struggle for a united, democratic and non-racial South Africa...” ( Shubin, 2008: 237). 26 December, Mandela was allowed to spend the day with Ahmed Kathrada, Walter Sisulu, Andrew Mlangeni and Raymond Mhlaba at Pollsmoor Prison. 9 January, Mandela was the first person awarded the freedom of the city of Sydney, Australia. UK Foreign Secretary Geoffrey Howe met Oliver Tambo at his official country residence, Chevening. 9 July, ANC members Paul Dikeledi and Cassius Make are assassinated by South African agents in Swaziland. This occurred when the taxi they were travelling in was ambushed. A Mozambican national is also killed. 9-12 July, The Institute for a Democratic South Africa (IDASA) organises a conference in Dakar, Senegal. The conference is attended by 61, mainly Afrikaans-speaking South Africans and a 17-person ANC delegation. The result is the Dakar Declaration which calls for the release of all detainees and the unbanning of the ANC. 16 July, The ANC issues a statement on the assassination of Paul Dikeledi and Cassius Make. October, Prime Minister Margaret Thatcher was still opposed to the African National Congress (ANC) and called them a terrorist organisation at the Commonwealth Summit in Vancouver. October, A set of preconditions are laid out by the ANC’s National Executive Committee before it could agree to hold talks with the government. These include the release of all political prisoners, the lifting of the state of emergency, the repeal of oppressive apartheid laws, the unbanning of all political organisations, the abolishing of the homeland system, and the unconditional return of all political exiles. November, A group of Afrikaner intellectuals meet ANC leaders at the Compleat Angler hotel at Henley, Oxfordshire. February, The United Democratic Front (UDF) and 17 other organisations were banned. 27 May, Anti-apartheid Afrikaners led by Frederik van Zyl Slabbert, IDASA director, meet with the ANC in Frankfurt, to discuss a post-apartheid South Africa. May, Nelson Mandela meets with the ‘secret working group’ of government officials led by Kobie Coetsee, at the officers club at Pollsmoor Prison. 11 June, The Nelson Mandela 70th Birthday Tribute Concert takes place at Wembley Stadium, London. This event, which runs for 11 hours, is watched by approximately 600 million people in over 60 countries. The line up includes 60 musicians, comedians and actors with star performers including Harry Belafonte, Whitney Houston, Roberta Flack and Stevie Wonder. A smuggled message from Mandela was read out and watched by 72 000 spectators and 200 million viewers in 60 countries. Youths burnt down the Mandela house in Orlando West. The community appealed for calm in response to Mandela's request that no criminal action be taken against the youths. The community rallied to help rebuild the Mandelas' house. The Mozambican government granted its highest award to Nelson Mandela. 14 August, Mandela was admitted to the Tygerberg Hospital in Cape Town and he is visited by Winnie Mandela. 9 December, Mandela is moved from the Constantiaberg Clinic to Victor Verster Prison where he is given a large warder's house to live in with a swimming pool and a big garden, as well as a personal cook. Certain restriction on the imprisoned Mandela are lifted, friends and family were now able to visit him. 29 December, James Seipei (known as Stompie Mokhetsi), a 14 year old ANC activist, and three other youths are picked up by members of Winnie Madikizela-Mandela’s bodyguard and the Mandela United Football Club after being accused of being a police informers. Stompie’s body is later found in Soweto stabbed through the neck.The "Mandela Crisis Committee" organised by Reverend Frank Chikane and including Cyril Ramaphosa, Aubrey Mokoena, Sister Bernard Ncube, Sidney Mufamadi and Reverend Beyers Naudé tried to get Winnie Mandela to disband the Mandela United Football Club. 16 February, Representatives of leading anti-apartheid organisations, including the UDF and COSATU, hold a news conference at which they announce that the organizations were distancing themselves from Winnie Mandela. This was due to allegations that a group connected with Mrs. Mandela, the Mandela United Football Club, was "associated" with a "reign of terror" in Soweto that included the abduction and beating of several Soweto youths on 29 December, resulting in the death of Stompie Mokhetsi. 19 February, Four of Winnie Mandela’s bodyguards are arrested at her home in connection with the death of Stompie Mokhetsi. February, The United Democratic Front (UDF) regrouped and, together with the Congress of South African Trade Unions (COSATU) formed the Mass Democratic Movement (MDM). 20 September, After the general election, F.W. de Klerk is inaugurated as the new State President. 9 October, The government announced that it will release 8 prisoners, including Ahmed Kathrada. 18 internal activists met Mandela at Victor Verster Prison. 15 October, After 26 years in prison, Rivonia trialists Walter Sisulu, Ahmed Kathrada, Andrew Mlangeni, Elias Motsoaledi, Raymond Mhlaba and Wilton Mkwayi, were released along with Oscar Mpetha, the veteran ANC and SACP leader in the Cape, and Japhta Masemola, a PAC leader. Their release was greeted with scenes of wild celebration around the country. 8 December, The Conference for a Democratic Future is attended by 4600 delegates representing 2000 organisations at Wits University. Smangaliso Mkhatshwa served as conference chairman, and Walter Sisulu was given a rousing welcome. The conference adopts the Harare Declaration. 13 December, F.W. de Klerk meets Mandela for the first time.